The Han Solo solo movie is mere months away from hyper-spacing into theaters, and it looks like Disney is finally getting on the media push. A screenshot of the final moment of the video shows everyone gathered around the pilot’s chair. 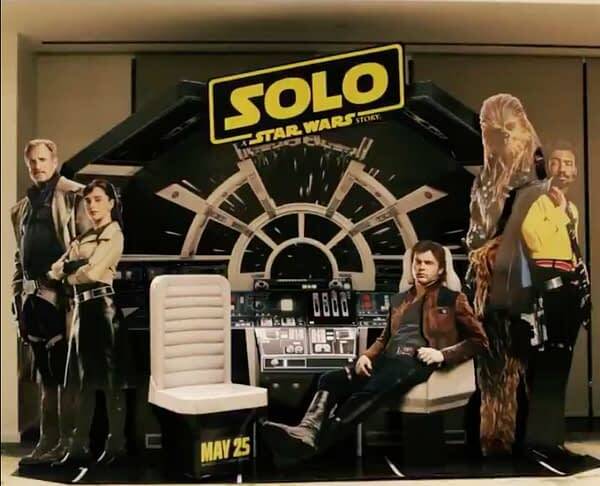 That’s Woody Harrelson as Beckett on the left, Emilia Clarke as Kira, Alden Ehrenreich as Han Solo, Joonas Suotamo as Chewbacca, and Donald Glover as Lando Calrissian. Ron Howard stepped in to complete the film after original directors Chris Miller and Phil Lord were let go from the project by Kathleen Kennedy for a myriad of reasons (that we’ll probably learn more about when the film opens). Solo will feature at least one piece of music by Star Wars composer John Williams, although John Powell (Shrek, How to Train Your Dragon, The Lorax) is handling the score for the film.